Fig. 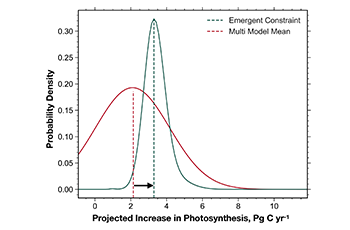 : Probability density functions of projected increase in photosynthetic carbon fixation for a doubling of atmospheric CO2 concentration, comparing the conventionally used multi-model average value and the observations-based Emergent Constraint estimate. In a new study, a team of researchers around Alexander Winkler and Prof Victor Brovkin from the department “The Land in the Earth system” at the Max Planck Institute for Meteorology (MPI-M) show that most Earth system models (ESM) underestimate the response of Arctic plant productivity to rising atmospheric carbon dioxide (CO2) concentration. 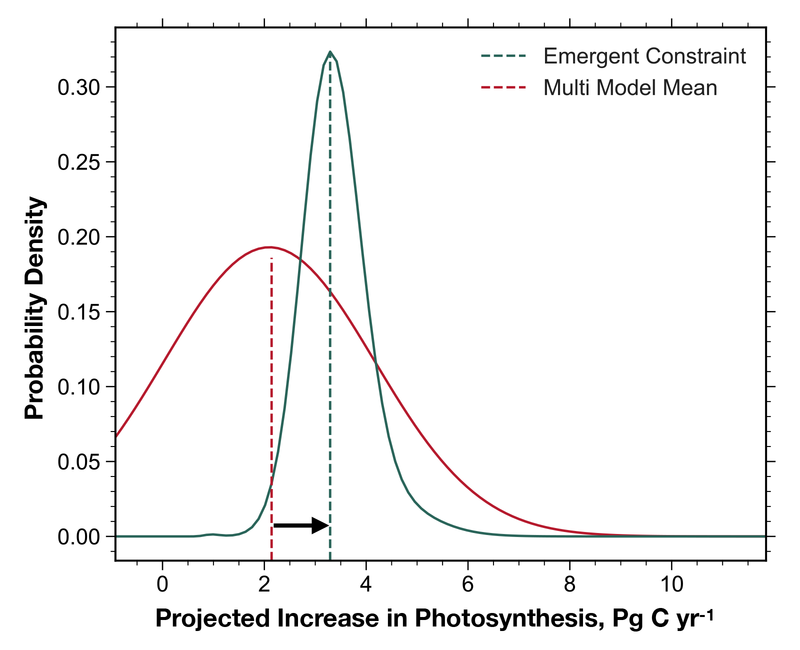 These models, which serve as the scientific basis for the IPCC Assessment Reports, likely also underestimate future carbon uptake by photosynthesis - a key aspect for climate projections. This is a surprising result as some previous studies suggested that ESMs overestimate the response of plants to rising CO2. Climate change has a strong footprint on the Earth. The signal is especially visible in high northern latitudes, where amplified warming not only causes permafrost thawing, but also promotes plant growth. Vegetation greening of temperature-limited ecosystems in a warming climate is a well-documented phenomenon. Using the novel approach of Emergent Constraints, the researchers linked changes in high-latitude greening to changes in plant growth as projected in a higher CO2 world. Satellite observations now reveal that the response to CO2 is considerably higher than the average ESM response. This finding indicates that most ESMs likely overestimate future atmospheric CO2 abundance and consequential climatic changes. “In our study led by Alexander Winkler, we were interested in the response of natural ecosystems to rising temperature and CO2 concentration and neglected human land-use changes. On global scale, however, the greening trend is mainly driven by intensive land-use in the two most populous countries, China and India” says Prof Ranga Myneni, co-author of the study, winner of the prestigious Humboldt Research Award and a long-term guest at the MPI-M. Land surface greening as observed by various satellite missions is a global trend. Over the last two decades, on average 310,000 square kilometers of extra green leaf area, roughly the size of Poland or Germany, appear on Earth’s land every year. “Arctic ecosystems are changing quickly in response to climate and CO2, affecting carbon fluxes; the land may turn from a small carbon sink to a source” says co-author Prof Victor Brovkin. He adds that although greening is dominant in the region, some areas show browning, likely in response to droughts and disturbances. He adds: “As climate gets warmer and growth period becomes longer, some areas are affected by too little moisture available for plants, especially in the presence of permafrost. A link between hydrology and carbon in the high latitudes is a promising research topic”. Where is the anthropogenic carbon?, is one of the key question in climate research. In their new study, the scientists shed more light on this important subject and show that the carbon sink through photosynthesis is likely stronger than expected. “Conclusively, predicting future climate change requires an accurate estimation of the strength of this so-called terrestrial carbon sink” adds Alexander Winkler.